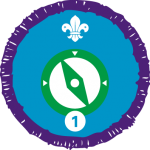 The Navigator Staged Activity Badge can be achieved from Stage One through to Stage Four. You should also be able to use a 1:25,000 and a 1:50,000 OS map to interpret contour lines to determine the shape and steepness of the terrain and learn what topographical features such as valleys, cols, ridges, and spurs are. You should be able to find north without the aid of a compass by day and by night and how to set a map without a compass.